Despite everything, Burns Road still maintains its stature as the pioneer food street of the country. Ramazan cannot be complete in our household without the presence of iftaari from Burns Road, Karachi. This Ramazan, as I went to Burns Road on the first day of fasting to buy items for iftaar, I was once again reminded of the strong sense of nostalgia that comes alongside the aroma of the food at this street. While in the other markets of the city the process of buying iftaar can start at around 4pm, here customers will start pouring in at around 2:30pm. 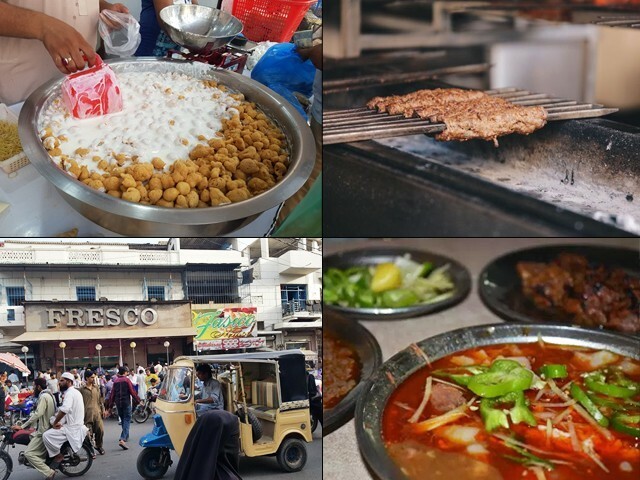 There is no doubt Burns Road is the original food street of Karachi. It was not set up purposefully by any government, rather it evolved naturally. People who migrated to Pakistan from India were settled in large numbers near this street, Pakistan Chowk, and other adjoining areas. 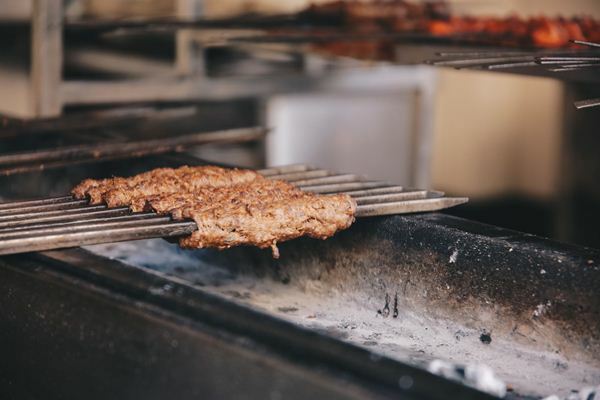 It is believed some families who probably had food businesses in India before Partition are responsible for launching the foundation of Burns Road as the hub of food in Karachi. 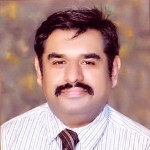 The street derived its name from British doctor James Burns, and although its name was changed to ‘Muhammad bin Qasim Road’ after Partition, people generally remain unaware of this change and the road continues to enjoy its fame with its old name. My first interaction with this street took place alongside my father and uncles, as it was a family tradition to go there early in the morning to buy nihari for breakfast. In the good old days, nihari used to be consumed for breakfast with naan or homemade parathas in Karachi as well. I still remember my college days, when I could eat a plate of nihari with two nans from Malik Nihari House for the meagre amount of Rs20, or could eat halwa puri for Rs5. Today, reasonably good nihari is available at every nook and corner of the city, a dish that once used to be a specialty of Burns Road, with people congregating in large numbers to Malik Nihari House, Waheed Restaurant or Sabri Nihari to buy the food item. Although Sabri Nihari is located a bit away from the main area, it deserves an honourable mention for being the main nihari place of yesteryear, located at the corner of the Jamia Cloth Market. 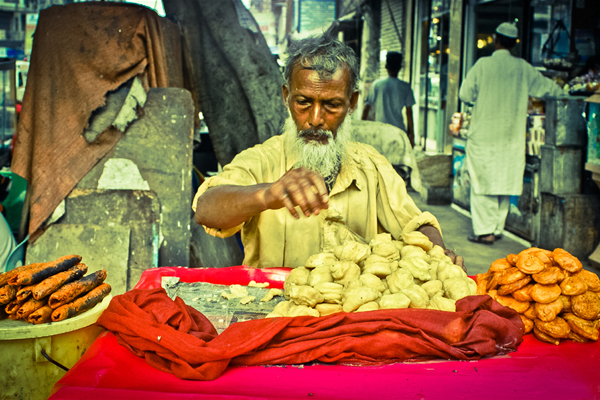 Rabri is another specialty of the street. 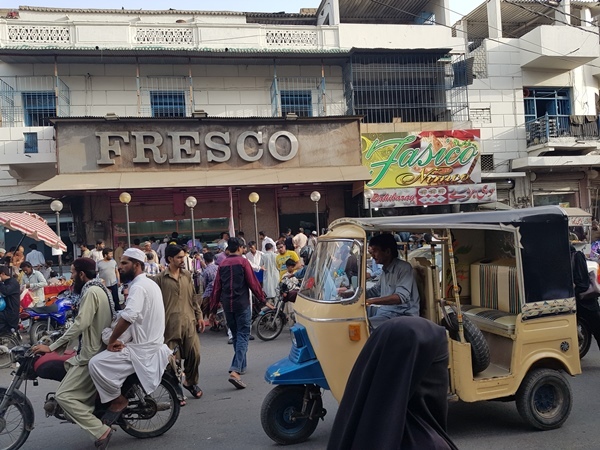 Today, a huge shop named Delhi Rabri House is located at the heart of Burns Road, but the old people of Karachi know the foundation of this establishment was laid on a push cart. Starting off in the mid-50s, a cart was parked at the corner lane that houses the Waheed Kabab House for decades, and sold rabri throughout the year, along with gajar ka halwa during the winters. Another personal favourite is the renowned Waheed Kabab House, the oldest and most famous barbeque place, serving the dhagey waley kebabs that were to die for. I remember my father bringing them home and helping my mother fry them in butter; a simple treat that created happy memories of my childhood. Matkey waley dahi barey is also a specialty of Burns Road. A big red matka (clay pot) is fixed outside the shop, and the shopkeeper has been selling this special item here for decades. 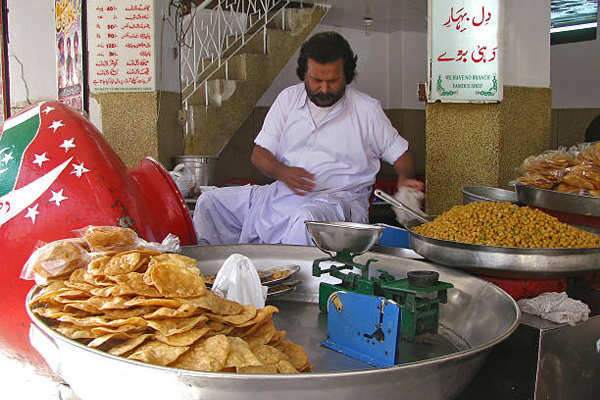 A discussion of the past is incomplete without mentioning Fresco Sweets, a shop popular for its dahi phulki and samosas. 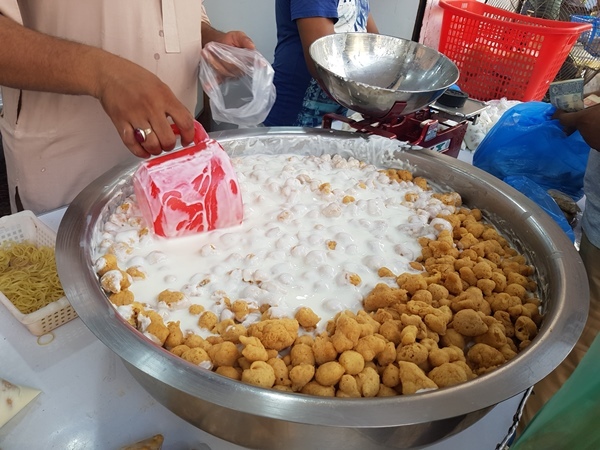 And of course, during the holy month of Ramazan, their speciality is Khajla and Pheni, while on Eid, people flock to get some of their famous Kachoris. The uniqueness of Fresco is that even today, they use real ghee when preparing their food. Burns Road was developed in an era when the concept of eating outside with families was minimal, which is why to this day, shops don’t have a decent sitting area for families, and the concept of takeaway is more common. In the good old days, when plastic shopping bags were not common, customers would bring their own pots to carry food in. So much water has gone under the bridge, and Karachi has transformed over the years, for better or for worse. However, despite it all, Burns Road still maintains its stature as the pioneer food street of the country. Its uniqueness can be highlighted by the fact that no big food chains have been able to make any inroads into the area, despite the large crowds the street manages to attract on a daily basis. Today, the public has the convenient option of restaurants that deliver, but what they cannot deliver is the essence of Karachi one can only find in the food at Burns Road. True food lovers prefer to step out of their houses and work places to especially visit this street and eat food that feels like home. Despite everything that has changed, Burns Road remains the identity of Karachi, and in my view, will remain so for many decades to come. Amongst all the food centres of our country, Burns Road is to food what Sachin Tendulkar is to cricket, and what Cristiano Ronaldo is to football – the ultimate icon.